1. Why Do Celebrities Play Such A Big Part In Our Imagination? Maybe things have changed somewhat since life in the Pleistocene era, but our neural hardwiring hasn’t. On some deeper level, we may think NBC’s Friends really are our friends. I’m not above admitting I’ve pictured myself as a seventh wheel sitting next to Rachel and Monica on the tattered sofa at Central Perk. More than once. I was miserable at home in Virginia, a thirteen-year-old with curly dark hair and ugly glasses I’d soon trade for blue-tinted contact lenses. Puberty felt like bitter molasses, as slow as my parents’ acrimonious and endless split. One stifling day in 1974, I couldn’t take their arguing, so I headed to Giant for Doritos, solace and escape. There it was! The first issue of People magazine in the checkout line. I snatched my copy with cover girl Mia Farrow smiling as Daisy in the film version of The Great Gatsby and headed home, a little bit of magic in my hands. I told no one. I saved my celebrity escapes for late nights alone in my room after exhaling goodnight to harsh reality I drew in during the day. People magazine was new, but my behavior wasn’t. A couple years before, I devoured Teen Beat under the covers with a flashlight, imagining I was The Partridge Family’s missing brother, the one my first celebrity crush David Cassidy would like better than TV bros Danny and Chris, and maybe even come save. 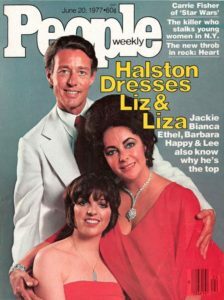 My dreams of escape morphed into full-fledged fixation when People’s cover featured Liza Minnelli, Elizabeth Taylor and Halston, touting the carefree revelry of New York City and Studio 54. I was obsessed with “Studio.” I wanted Liza and I to ride a white horse into her birthday party, past black velvet ropes, a mirrored disco ball overhead. I wanted to be worthy of entry into the exclusive VIP section, which, as I discovered later, was a filthy, blue-lit basement. Since then, I’ve seen David Cassidy in concert, where I tried to make eye contact and reconcile the remnants of my teen idol behind crow’s feet and age lines. I waved at a very un-Daisy Mia Farrow buying pasta at Fairway on the Upper West Side near where I lived, and she waved back. I met Liza several times, including once sitting next to her at Eighty Eights piano bar in the West Village. “Hi honey,” she said, glancing over like a neighbor. I couldn’t have known when I was a teenager that the seeds of my celebrity escapism would one day grow into a beanstalk that led me into the fringes of the world I’d dreamed about. Back then it was enough to breathe easy and dream while reading about David and the Partridges, Mia and Liza. They were the first times, but certainly not the last, that celebrity was my ladder to escape. August 31, 1997. On the last night of my summer in East Hampton, I ventured out to a nightclub—The Swamp, home to a swirling, mirrored disco ball left over from Studio 54. I stood restless at the bar; for some reason, I couldn’t sit still that night. CNN played in the background, but no one paid the television any attention. My stomach sank when the music stopped as a talking head mumbled above the din and people pointed to the screen, though no one could hear the man on TV. 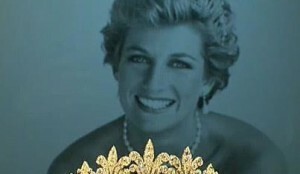 Word-of-mouth in the form of fast, whispered waves crashed across the room: Princess Diana. Paris tunnel. Car accident. She’s OK. Dodi’s dead. If this happened today, I’d pull out my cell phone and call or text a friend. Instead, I did what everyone did back then when faced with overwhelming, surreal news: I turned to the stunned strangers beside me, as much to make the unreal seem real as to help absorb the shock. Two older men on my right let out pained exclamations, and the three of us huddled together for a few minutes, connecting over an abstract but profound grief. We talked as if we knew her personally, and, in my case, it turns out that the two of them did. It took me a minute to realize I was talking to Calvin Klein and Barry Diller.